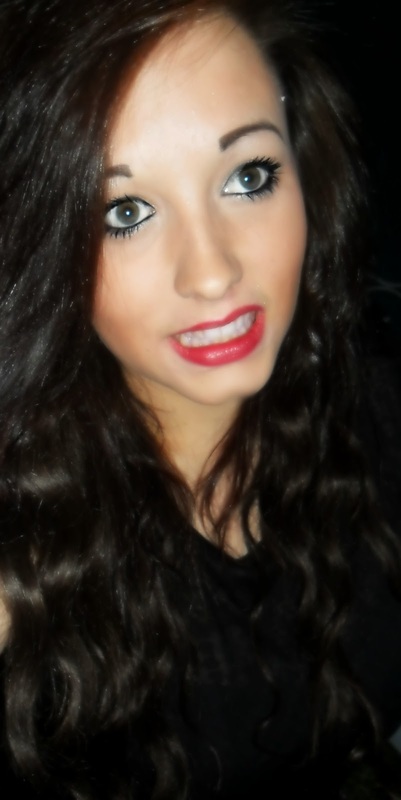 Anyway, on Sunday, we went shopping in Glasgow. I didn't take too much money with me as i knew i would just spend it all so i just picked up a few pieces and decided to do a style me with one of them! Basically, i'm going to show you a dress i bought from H&M and i'm going to pick pieces i own that i would wear with it to dress it up for a night look, and down for a day look.. Then i want you to tell me how you would style it! I am unable to find the dress on the H&M website so i'm just going to use my own pictures and hope it portrays it as beautiful as it actually is! Lighting again was not on my side so the photos show the dress a blueish colour up close when in reality it is more of a foresty, emerald green. 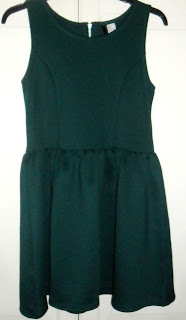 I never go for green, in fact i hardly own any but i loved this dress! 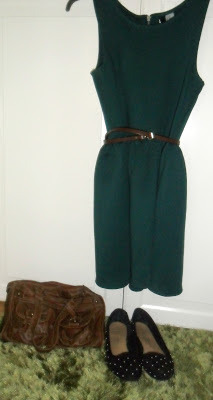 I've added a brown belt (New Look) to make the dress more casual, a brown handbag (vintage) and black studded flats (Primark). Since it is winter now in the UK i would probably throw my leather jacket or black blazer on over and maybe a scarf or snood and some black tights! 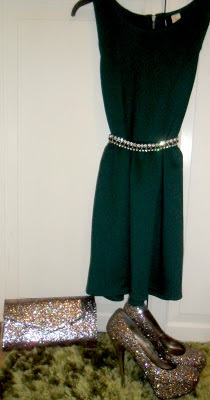 So for a night look i decided to pair the dress with my glittery stiletto heeled shoes (Schuh), matching clutch bag (Matalan) and diamante studded belt (River Island). I would probably throw my black blazer on too just to get to where ever i was going :). Hope you like this type of post because i really enjoy doing them. How would you style this green dress? Would you like an OOTD with these outfits? Absolutely love the style choices you've made in this post. Love love love the green dress.